Will Never Rust, Stain, Corrode, Break or Warp. 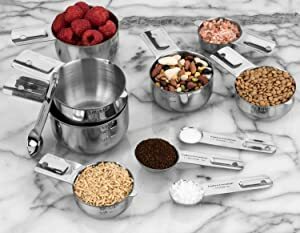 Crafted with non-porous, food-grade safe stainless steel, our measuring cups and spoons come in a wide range of sizes to fit all your breakfast, lunch, dinner, and baking needs. 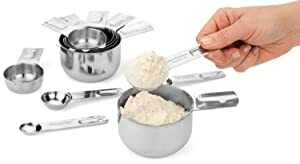 Our measuring cups and spoons are tough enough for all-purpose use, you can enjoy them in the kitchen or use them when you’re at your BBQ grill. Our food-grade 18/8 stainless-steel is not only more durable and rust resistant than the competition, but it also doesn't harbor germs, making cleanup a breeze. They are smooth and rounded inside making them perfect for sticky ingredients. Simply wash by hand with soap and warm water or load them into the dishwasher for fast clean up. Each cup features stamped measurements on the handle, the outside of the cups, and parital measurements on the inside. Every spoon handle has laser engraved measurements that makes it easy to see, identify the volume, and start using them right away. The laser engraved markings will never fade or wear out. Save counter, cabinet and drawer space with our our nesting design. Simply clean them, stack them, and hide them away when not in use. 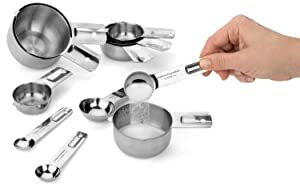 Our measuring cups and spoons save essential kitchen space; perfect for all kitchen sizes! Made with superior crafsmanship from a single piece of 18/8 stainless steel, they are built to last a life time. They will never rust, stain, corrode, break or warp. 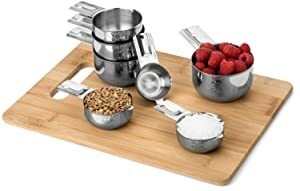 You will never need to buy another set of measuring cups & spoons again, because these are a buy it for life set.